In the heavily contested election race for San Diego mayor, there’s one candidate whom you should clearly not support: Bonnie Dumanis, the District Attorney of San Diego County. It’s probably impossible to create a full list of all the nefarious actions and inactions she has committed during her career, but the following are a few highlights to give you a flavor of what Dumanis represents. You can also find additional concerning reports regarding Dumanis on Maura Larkins’ summary of coverage on the suspicious actions of Bonnie Dumanis. As the San Diego Union Tribune reported, the San Diego DA office frequently fails to prosecute lawyers and other current or former government employees for serious crimes. DA Bonnie Dumanis is well known for her pattern of irresponsible failure to prosecute people who have connections to the courts and government. After a trial late last year, the State Bar Court of California concluded that Carlsbad lawyer Patricia Gregory improperly withdrew more than $112,000 from client trust funds. A judge recommended Gregory for disbarment in March, and the attorney is fighting the decision. She is not eligible to practice law while the review process runs its course. Gregory has not been prosecuted, nor have several other attorneys who faced such findings from the bar. Critics say the District Attorney’s Office should act in such cases, but the staff says there are many complicating factors, such as different standards of proof and the need to set priorities. In San Diego County, you can expect that short of mainstream media raising a crime by one of these people to the public’s attention, there will be no prosecution even when it is warranted. A lawyer stealing funds from a client such as former DA employee Patricia Gregory (who was eventually prosecuted for taking over $100,000 in client funds), government employees and contractors perjuring in court and causing millions of dollars in damage to their victims, and engaging in malicious false prosecutions are all among the types of crimes the San Diego DA would like to ignore. Failing to prosecute such crimes in presence of compelling evidence they did occur thereby encourages such criminal conduct to continue. In the case of Patricia Gregory, Dumanis was forced by public pressure to prosecute her and a conviction was obtained. But how many other cases were brushed under the carpet and stayed there because the public didn’t press the DA to prosecute obvious criminal behaviors for which credible evidence was available? San Diego family court critic Eileen Lasher has also criticized District Attorney Bonnie Dumanis for failing to protect the community from lawyers committing crimes. One of her examples is how San Diego attorney Theresa Erickson engaged in “baby selling crimes” violating California adoption and surrogacy laws for years as DA Dumanis and the San Diego courts looked the other way. Seemingly because of the severe corruption throughout government and courts in the San Diego region, it took US federal government intervention to put a stop to the baby selling ring. If you are a decision-maker working for the government who is friendly to her or are a wealthy friend of somebody in such a role in San Diego County, Bonnie Dumanis will tend to ignore your violations of the law. That is unless you are running for office against her or one of her friends. Then she is ready to abuse the powers of her office to wrongly harass you for daring to oppose her, even when no crime has been committed. She organized a “Public Integrity Unit” run by Patrick O’Toole which was obviously used to implement this policy. Each year a new set of 19 San Diego citizens is seated as the San Diego Grand Jury. Applications for the 2011 / 2012 Grand Jury are now being accepted through January 14, 2011. The Grand Jury could be hugely helpful to cleaning up the mess in San Diego’s courts, but despite the evidence of widespread misconduct particularly in the family law courts, the current and past Grand Juries have been stymied from going after judicial criminals. In this article I aim to point out how this could change if the right people get into the next Grand Jury and are willing to take some personal risks to protect the public from the out-of-control abusive judicial system in the county. If you and your family have been harmed by the government and courts of San Diego, I strongly suggest that you consider taking a year out of your life to get a seat on the Grand Jury and use it to pursue the government criminals who are harming and destroying so many families in the county. California’s county Grand Juries are tasked with investigating and reporting on problems in county and local governments. However, the San Diego County Grand Jury has been effectively prohibited from investigating the San Diego Superior Court itself for a variety of reasons. Aside from whatever legal technicalities there may be for this, it is clear there is a strong motivation for the government officials who control the county to prevent investigation of the court system itself. The government wants naive citizens to believe that the courts in the county are fair and obey the law when neither is true. The San Diego Superior Court is filled with abuse, corruption, illegal conduct, and disreputable judges such as drunk driver Lisa Schall, cover-up scam artist Lorna Alksne, abusive Christine Goldsmith with her nepotistic control over the San Diego City Attorney, and TV-star-wannabe DeAnn Salcido (who recently resigned over her misconduct) that the Grand Jury would literally have to investigate most judges for misconduct and eventually verbally eviscerate the judiciary and file criminal indictments against many of them to even get a start on cleaning up the corrupt mess that these judges wish to remain hidden. Many of these judges and court officials have ties to other “civil servants” such as San Diego City Attorney Jan Goldsmith, District Attorney Bonnie Dumanis, Sheriff William Gore, and others who use the courts and government offices as their personal playthings to harm their opponents and critics alike. Consequently, there is every intent by the government to hide the widespread judicial corruption and lawlessness. Aside from keeping secret their illicit plans and connections, they also endeavor to maintain their tyrannical grip on power by attacking and marginalizing their victims. They do this because if the public were to understand how many people have been badly harmed by the lawless tyrants seated in government positions throughout San Diego, there might be a public uprising against them. In the wake of what appears to be a wrongful arrest of California Coalition for Families and Children co-founder and president Cole Stuart, the evidence is building that one of the primary culprits in this matter is the San Diego County Bar Association (SDCBA). We’ve obtained copy of computer file containing a letter directed to Patrick L. Hosey, President of the San Diego County Bar Association. In the letter, Cole Stuart describes the events of the April 15, 2010, family law seminar sponsored by the SDCBA at which their staff and private security guards allegedly handcuffed and removed him from the event. This is despite the facts that he is a licensed attorney who paid for admission to the event, the arrest warrant for him was obtained in an irregular fashion that suggests judicial misconduct was involved, and the San Diego Police Department (SDPD) and San Diego Sheriff Department officers on the scene wanted to wait until after the event to make an arrest. SDPD officers pointed out that it was highly unusual for an arrest warrant to be issued over a misdemeanor alleged violation of a temporary restraining order. Possibly even more unusual is that the TRO was not served on Cole Stuart until April 16, two days after the issue of the arrest warrant tied to the TRO and one day after he had already been arrested. We’re not ready to endorse a candidate for San Diego Sheriff yet, but we do believe that we have ample reason to advise voters to vote for somebody other than Bill Gore. Gore is a member of the “good old boys’ network” of San Diego political corruption. 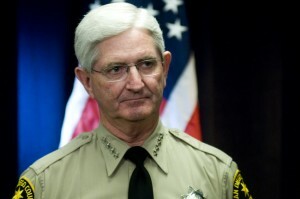 His personal friend, former Sheriff Bill Kolendar, jammed through Gore’s role as interim sheriff with full support of the San Diego County Board of Supervisors when Kolendar retired in 2009. From speaking with those familiar with Gore and the duties of the sheriff who benefit from a vantage point inside of the Sheriff’s Department, it is our understanding that there is little respect for Gore from many of the officers of the department. Gore reportedly hasn’t ever held a role in local law enforcement previous to becoming interim sheriff via backdoor political machinations. What experience Gore has in law enforcement comes from serving as an FBI agent for 32 years. Yet in this capacity, Gore did not have to manage large numbers of personnel, manage a budget, or perform many of the other tasks that the sheriff must handle. But management inexperience may be a minor concern compared to the others arising out of Bill Gore’s history with the FBI and his ties to the corrupt political machine ruining San Diego County. More concerning, Gore’s record as an FBI employee is fraught with problems. He was the agent in charge for the Ruby Ridge FBI assault on Randy Weaver’s family that resulted in multiple fatalities, including the death by shooting of a mother holding a baby and a child shot in the back as he fled law enforcement gunfire. The government settled out of court with a $3.1 million award to Randy Weaver for the wrongful deaths of his wife and son. On April 15, CCFC co-founder and attorney Cole Stuart was arrested in what appears to be a stunt staged by San Diego family law system employees, possibly including Judge Lorna Alksne and Judge Lisa Schall. It appears incontrovertible that the impending CCFC protest at the San Diego County Bar Association family law seminar on April 15 was well-known to court employees starting on April 14, the day on which an arrest warrant was issued for Cole Stuart. We have observed there was a spike in activity on our web site by employees of the San Diego Superior Court on that, less than two days after we posted our article discussing the impending CCFC protest at the SDCBA family law seminar. While this doesn’t prove judicial bias on its own, it shows these judges were likely aware of the impending protest. It is also consistent with the opinion that San Diego judges viewed having Cole Stuart arrested as an opportunity to quash vociferous political opponents by abusing their authority. This is breaking news with little information available from the mainstream media. We clearly don’t have all the details yet, but we’ll let you know what we have learned so far. The protest was peaceful and reasonably calm except for the interruption caused by the arrest. One of the protesters reported the officials at the site said they were being “great protesters”. Cole Stuart was in good spirits despite being arrested. He complied with officers’ requests. CCFC group members photographed the arrest, in part to keep the police in check. After being released, Stuart said the officers “were extremely cool and supportive of our cause” and talked about how some of them had spoken of being harmed by stunts like this in their own previous relationships. CCFC co-founder Dr. Emad Tadros posted bail for Cole Stuart. Bail was $25,000 for misdemeanor charges of stalking and annoying telephone calls. 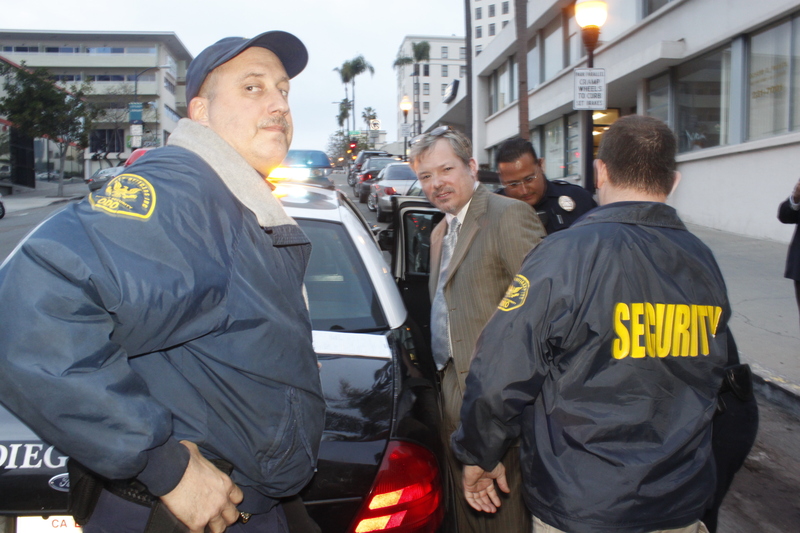 At the April 15 protest against the corrupt San Diego family law courts the San Diego Police Department arrested one of the leaders of the group, Colbern Stuart III, an attorney and vocal critic of the California family law courts. The arrest appears to possibly be an attempt at intimidation and harassment against San Diego parents who are fed up with the abuses they are facing at the hands of the local family law courts. It may also be part of the alleged parental alienation campaign being conducted by Lynn Stuart, San Diego CW6 News Reporter and ex-wife of Cole Stuart. She and many in the San Diego family law community, including specifically Stephen Doyne, Judge Lisa Schall, and Judge Lorna Alksne, have personal reasons to want to attack and harm Cole Stuart and other CCFC group members.